When Apple bought Camel Audio in 2015, it made huge waves by becoming the owner of the popular freeware plug-in – Alchemy synth. Since then, Apple redesigned the version of the synth, and it appeared on Mainstage and Logic X. An interesting aspect is that Apple introduced the plug-in in GarageBand 10 last year. The addition of Alchemy provides an exceptional choice for budding artists as well as professionals to utilize the synth to its maximum potential. It functions identically to the than standalone application. Users can gain access to the plug-in with the help of the keyboard touch instrument menu. Apple is providing over 150 designed patches in a different variety of genres. So, Let’s move forward to know what is Alchemy plugin. Alchemy, the synth plug-in is available on GarageBand 10 and is accessible for users who are using the iOS software. Therefore, you can gain access to the plug-in if you are running GarageBand on iPhone 6 or later, iPad Mini 4 or later, and iPad Air 2 or later. The earlier versions of the devices introduced by Apple will have basic functionality in GarageBand. The availability of Alchemy in the latest devices is due to the availability of the A8 chipset and higher, which are capable of processing GarageBand with ease. You can quickly open the plug-in, which is available underneath the keyboard instrument. 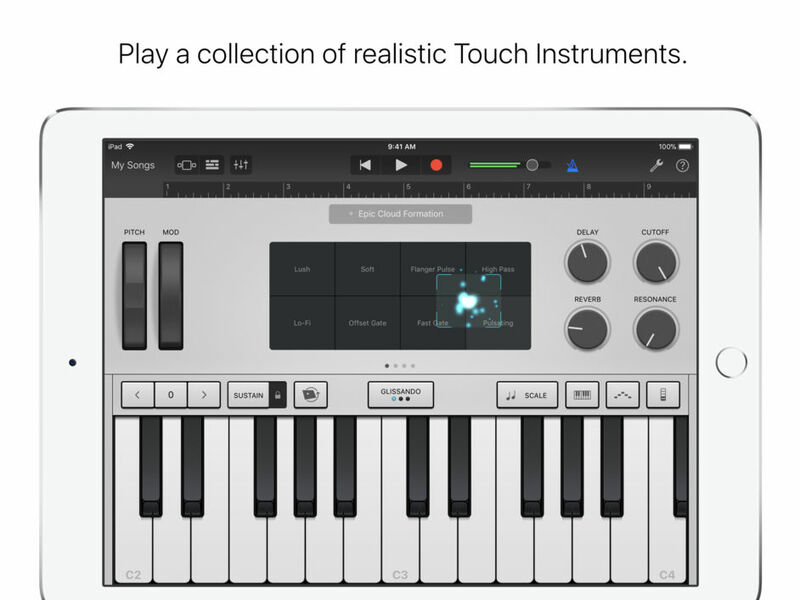 The appearance of the synth is familiar and similar to that of other devices offered by GarageBand but with a few notable differences. Tapping at the left corner of the menu will open the sound browser. The sound browser consists of over 150 patches, and you can select any one of them according to the requirement. For example, let us proceed by choosing the Arp Animations from the patches. The availability of pitch and modulation key helps the user to redefine the output of the patch. One can change the key according to the requirement and hear the changes in real-time. Here, Some of the features of Alchemy synth plugin is given below. So, Know how the synth plugin is working. The most excellent feature of the Alchemy synth plug-in in GarageBand is the Transformation pad. The transformation pad consists of eight sonic snapshots. These snapshots allow you to transform the selected patch in different wave formats. If you have acquaintance with the transformation pad on Mac, then you will feel at home when using it here in GarageBand. The Alchemy synth plug-in also has 12 dials that help you to further change the wave format depending on the selected sonic snapshot from the transformation pad. The availability of X and Y pads helps you to change the parameters of the dials, which again depend on the selected sonic snapshot. The X and Y pads are helpful in bringing out a creative mixture of sound from the original patch. You will gain the occasion to test the creative side of your brain. You can choose the arrow marks provided about the key stands to change the value by octaves. The value can be lower or higher depending on the requirement. Activating the latch control is helpful in recording a node. Tapping it will record a node and continue to play until deactivation. It is useful in composing music where you do not have to pause each time and start over from the beginning. However, depending on the selected patch, the functionality of the latch changes to a sustained control. You can control the keyboard in three different ways – Glissando, Scroll, and Pitch. The ease of changing the usability of the keyboard varies from one composition to another and according to the user. Addition of the Alchemy plug-in into GarageBand 10 is providing the opportunity for budding artists to turn into musicians and even producers. With the above information in hand, it now becomes easy to get started and bring out the next trending track. Utilize the features provided by the plug-in to bring out the best composition. With several options available within the application in the form of instruments, you have a major advantage in creating or remixing a track. All you need is the basics of music along with the ability to combine different instruments for the best output. Download GarageBand 10 today and begin utilizing the Alchemy plug-in on your iOS device. Ensure that the device is compatible and that the plug-in is functioning. You can check garageband for windows which clearly has the ways how you can run Garageband on your windows desktop. How To Wipe Out Everything from Smartphones before Selling?